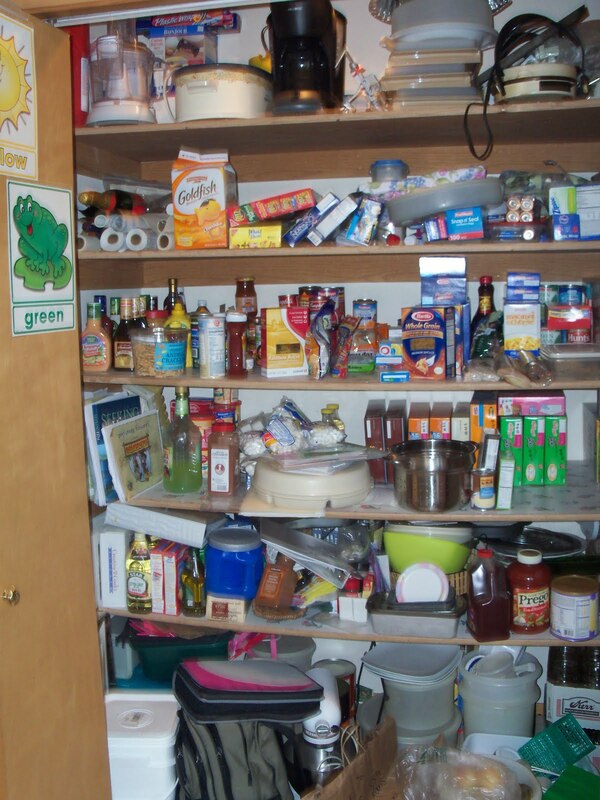 So it took three days, but the pantry is all cleaned and organized. The girls loved helping with this task. We started at the top emptying one shelf at a time and wiping down that shelf. Then we put things back in using a little more organization. The top shelves are for tupperware & appliances, the next two shelves are for food. The next shelf for incoming craft items & the floor for heavy food items. I had hoped to have a discerning eye regarding what to keep & what to get rid of, but I actually found very little I could part with: Mostly a few pieces of Tupperware that are rarely used or redundant. A few other finds: The infant head rest from a friend's baby swing that I returned several months ago (didn't even know it was missing), 17 empty plastic bottles from ketchup, syrup & salad dressing, a big can of chili & a box of 8 wine glasses I had completely forgotten about, and one nice discovery - I have tons of great serving dishes & hostess stuff. I should have people over more often. My personal goal for this space was to clear a shelf that could eventually be used for my craft supplies. Currently these are all housed in the garage and I would absolutely love to get my paper crafting stuff inside and more accessible. Also, I needed to clear space on the floor for some bulk food that is coming in and the canning jars that I'll be filling up come end of summer/fall. Mission Accomplished! 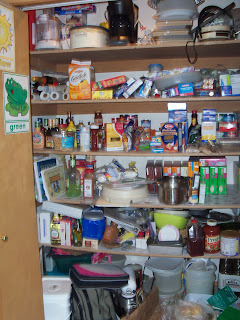 Now that it's organized I am hoping to limit my food purchases to what fits on the "food shelves." The heavy canning jars and bulk food that are in bins ie. flour, sugar, oatmeal, rice will have to be stored on the floor. All other food purchases will have to fit on the two other shelves, including the ridiculous cereal deals that will be coming this summer. 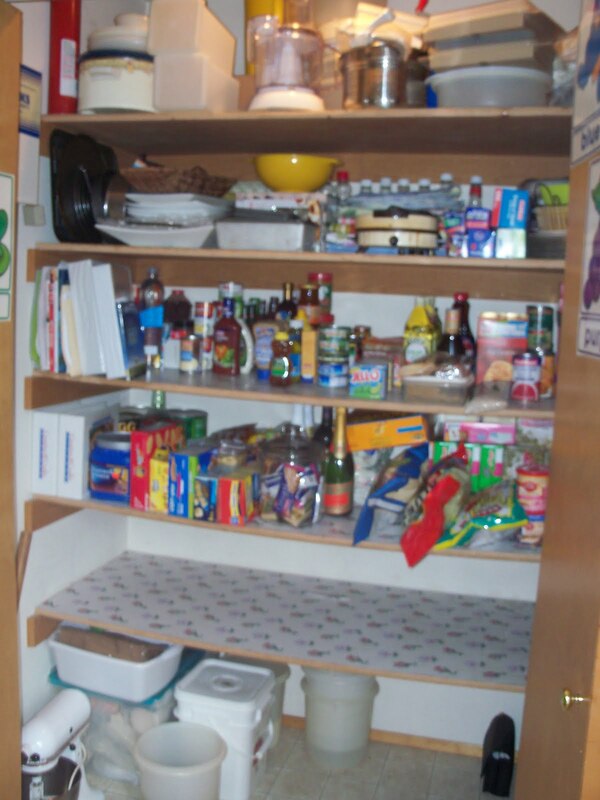 It's a huge pantry and even this much space allotted to food will allow a sizable stockpile. Monday Menu Plan - Out with the old. Restaurant.com deal - Today Only!